Athens ( Greek: Αθήνα, Athína IPA: /a'θina/) is the capital and largest city of Greece. Named after goddess Athena, Athens is a cosmopolitan metropolis with a population of 3.7 million people. The Athens metropolitan area constitutes the center of economic, financial, industrial, cultural and political life in Greece. The city is also rapidly becoming a business centre in the European Union. Ancient Athens was a powerful polis city-state and a renowned centre of learning, home of Plato's Academy and Aristotle's Lyceum. It is often referred to as the cradle of Western civilization, largely due to the impact of its cultural and political achievements during the 5th and 4th centuries BC on the rest of the then known European Continent. The classical era heritage is still evident in the city, portrayed through a number of ancient monuments and artworks, the most famous being the Parthenon on the Acropolis. Athens was the host city of the first modern-day Olympic Games and, more recently, of the 2004 Summer Olympics. In ancient Greek, the name of Athens was Ἀθῆναι-Athenai, plural of Ἀθηνά-Athene, the Attic name of the Goddess Athena. The city's name may have been plural, like those of Θῆβαι-Thebai ( Thebes) and Μυκῆναι-Mykenai ( Mycenae), because it consisted of several parts. In the 19th century, this name was formally re-adopted as the city's name. Since the official abandonment of Katharevousa Greek in the 1970s, however, the popular form Athína has become the city's official name. See also a list of alternative names for Athens. The Parthenon, a landmark of Western Civilization. Lykavittos Hill stands in the background (right side). Athens was the leading city in Greece during the greatest period of Greek civilization during the 1st millennium BC. 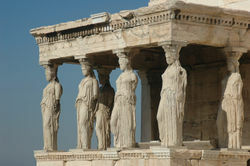 During the "Golden Age" of Greece (roughly 500 BC to 323 BC) it was the world's leading cultural and intellectual centre. In 431 B.C, Athens went to war with another city-state, Sparta. Athens was defeated by Sparta, and its walls were pulled down (however, remnants of the original walls of the era are still to be found today, especially in the coastline of Piraeus). The schools of philosophy were closed in AD 529 by the Christian Byzantine Empire, which disapproved of the schools' pagan thinking. Athens gradually lost a great deal of status at this time. 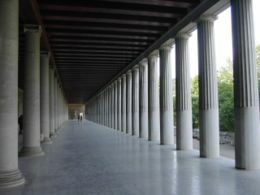 The Propylaea of the University of Athens, part of the "Trilogy" of Theofil Hansen. The building now serves as both a ceremony hall and a rectory. During the 11th and 12th centuries the Byzantine city experienced a revival. This period is considered the Golden Age of Byzantine art in Athens. Almost all of the most important Byzantine churches around Athens were built during these two centuries. Meanwhile, together with Corinth and Thebes, Athens was enriched by trade, and soon became an important and prosperous centre for the production of soaps and dyes. However, it faced a crushing blow between the 13th and 15th centuries, when the city was fought over by the Greek Byzantines and the 'French' and Italian Crusaders. In 1458 the city fell to the Ottoman Empire under Sultan Mehmet II the Conqueror. As the Emperor entered the city, he was struck by the beauty of its ancient monuments and issued a firman (imperial decree) that Athens' ruins not be disturbed, on pain of death. The Parthenon was in fact converted into the city's principal mosque and therefore preserved. 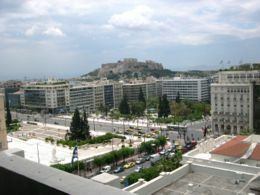 View of Syntagma Square and the acropolis in central Athens. Despite the Sultan's good intentions to preserve Athens as a model Ottoman provincial capital, the city's population went into decline and conditions worsened as the Ottoman Empire declined from the late 17th Century. As time went by, the Ottoman administration slackened its care for Athens' old buildings; the Parthenon (or Mosque) was used as a warehouse for ammunition during the Venetian siege of Athens in 1687, and consequently the temple was severely damaged when a Venetian shell targeted the site and set off several casks of gunpowder stored inside the Parthenon. 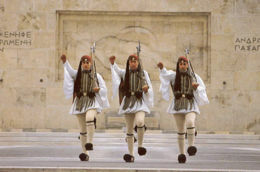 The Ottoman Empire relinquished control of Athens after the Greek War of Independence (1821–1831). The city was inhabited by just around 5,000 people at the time it was adopted as the capital of the newly established Kingdom of Greece on 18 September 1834. During the next few decades the city was rebuilt into a modern city adhering mainly to the Neoclassic style. In 1896 Athens became the first host city of the revived 1896 Summer Olympics.The next large expansion occurred in the 1920s when suburbs were created to house Greek refugees from Asia Minor. During World War II the city was occupied by Germany and fared badly in the war's later years. The statue of Theodoros Kolokotronis in Stadiou Street, central Athens. The Old Parliament stands tall behind it. Athens grew rapidly in the years following World War II until ca.1980 and suffered from overcrowding and traffic congestion. Greek entry into the EEC in 1981 brought massive, unprecedented investment into the city along with problems of increasingly worsening industrial congestion and air pollution. Throughout the 1990s the city's authorities undertook a series of decisive measures in order to combat the smog which used to form over the city, particularly during the hottest days of the year. Those measures proved to be successful and nowadays smog or nefos in Greek is much less of an issue for Athens, even when temperatures soar above 40 C. The traffic congestion has also significantly improved in recent years. 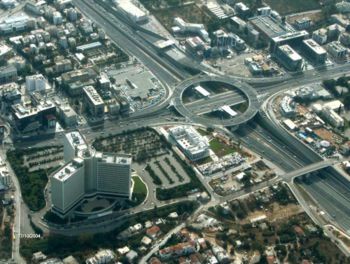 Part of this improvement is attributed both to the transformation of the once highly problematic Kiffissos Avenue into a modern, 8 lane urban motorway that stretches for more than 11 km along the ancient Kifissos River, linking many of Athens' western suburbs, from Peristeri to the port of Piraeus and to the construction of the Attiki Odos motorway. The temple of an Olympian god, Zeus, in central Athens. Athens sprawls across the central plain of Attica, which is bound by Mount Aegaleo in the west, Mount Parnitha in the north, Mount Penteli in the northeast, Mount Hymettus in the east, and the Saronic Gulf in the southwest. Athens has expanded to cover the entire plain making future growth difficult. The geomorphology of Athens causes the so-called temperature inversion phenomenon, partly responsible for the air pollution problems the city has recently faced. (Los Angeles, with similar geomorphology, has similar problems). Along with its numerous suburbs, Athens has an official population of about 3.2 million. The actual population, however, is believed to be quite higher, because during census (taking place once every 10 years) some Athenian residents travel back to their birthplaces and register as local citizens there. Also unaccounted for are an undefined number of unregistered immigrants originating mainly from Albania. Therefore it is estimated that the actual figure reaches 3.7 million, representing approximately one-third of the total population of Greece. 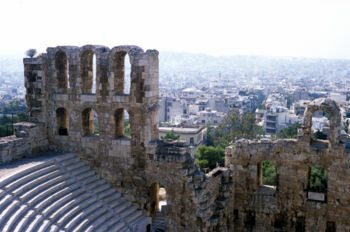 The ancient site of the city is centered on the rocky hill of the acropolis. In ancient times the port of Piraeus was a separate city, but it has now been absorbed into greater Athens. The rapid expansion of the city initiated in the 50's and 60's continues today, especially towards the East and North East (a tendency that is greatly related to the new Eleftherios Venizelos International Airport and Attiki Odos, the freeway that cuts across Attica). By this process, Athens has engulfed many former suburbs and villages in Attica and continues to do so. Athens enjoys a typical Mediterranean climate, with the greatest amounts of precipitation mainly occurring from mid-October to mid-April. The rest of the year remains largely rainless, making Athens one of the sunniest cities in the European continent. Sheltered by mountain barriers from the full force of the western, rain-bearing winds, Athens has a semi-arid climate and averages less than 500 mm of precipitation annually. Winters are generally mild, with comfortable daytime temperatures and cool nights, though light frosts may occur on infrequent occasions (it has to be noted however, that northern suburbs - that stand at a higher elevation - have a somewhat different microclimate, with cooler summers and colder winters with quite heavier average snowfall). Winter rainfall tends to occur in the form of short and sometimes heavy showers. Snow is relatively rare, although the city has experienced its share of blizzard-like conditions. The most recent examples include the blizzard of January 2002 as well as that of February 2004, all dumping heavy amounts of snow that literally blanketed the entire metropolitan area for days. Spring and autumn are considered ideal seasons for sightseeing and indeed for all kinds of outdoor activities. Summers can be particularly hot and at times prone to smog and pollution related conditions (admittedly, however, much less so compared to the past). The average summer daytime maximum temperature is 32 degrees Celsius (90°F). Heatwaves are not too common and mostly happen during the months of July and/or August, when hot air masses come to Greece from the south or the southwest. It is only on such days that temperature maxima shoot over 38°C. The all time high temperature for the metropolitan area of Athens is +45.0°C and was measured at the Nea Filadelfia suburb (July 2000, HNMS station); the equivalent all time low temperature record is -10.8°C and was measured at the Votanikos station. During the severe spell of cold weather, in February 2004, temperatures in Greater Athens dropped to -10.1°C at the Penteli station of the National Observatory of Athens. 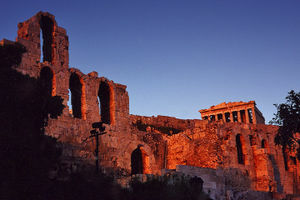 Athens has been a popular destination for travellers since antiquity. Over the past decade, the infrastructure and social amenities of Athens have been radically improved, in part due to the city's successful bid to stage the 2004 Olympic Games. The Greek state, aided by the E.U., has poured money into major infrastructure projects such as the new, state-of-the-art "Eleftherios Venizelos" International Airport, the massive expansion of the Metro system, and the new Attiki Odos ring-road. Home to a vast number of 5 and 4 star hotels, the city is currently the 6th most visited capital in Europe. Large parts of the city centre have been redeveloped under a masterplan called "Unification of Archaeological Sites of Athens" . Notably, the famous Dionysiou Aeropagitou street has been pedestrianised, forming a scenic route. 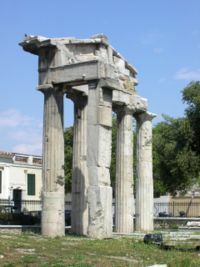 The route starts from the Temple of Olympian Zeus at Vasilissis Olgas Avenue, continues under the southern slopes of its acropolis near Plaka and finishes just outside the temple of Hephaestus in Theseum. This route provides the visitors views of the Parthenon and the Agora (the meeting point of ancient Athenians), away from the busy city centre. Near Syntagma Square stands the Kallimarmaro Stadium, the place where the first modern Olympic Games took place in 1896. It is a replica of the ancient Athens Stadium. It is the only major stadium (60,000 spectators) made entirely of white marble from Penteli, the same as that used for the construction of the Parthenon. Athens features a number of hills. Lykavittos is one of the tallest hills of the city proper that, according to an ancient legend, was actually a boulder thrown down from the sky by the Goddess Athena. Located in the city centre, near Alexandras Avenue and Vassilissis Sofias Avenue, it offers views of sprawling Athens below. On top of it, stands St. George's church. Philopappos Hill is yet another famous hill, located just to the southwest of Acropolis. The Panathinaiko Kallimarmaro Stadium, site of the 1896 Olympic Games. 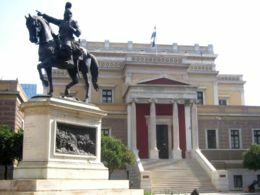 The city's classical museums include the National Archaeological Museum of Athens at Patission Street (which holds the world's greatest collection of Greek art), the Benaki Museum in Pireos Street (including its new Islamic Art branch) , the Byzantine Museum and the Museum of Cycladic Art in the central Kolonaki district (recommended for its collection of elegant white metamodern figures, more than 3,000 years old) . Most museums were renovated ahead of the 2004 Olympics. A new Acropolis Museum is being built in the Makriyanni district according to a design by Swiss-French architect Bernard Tschumi. The Athens Planetarium , located in Andrea Syngrou Avenue, is considered to be among the world's best. 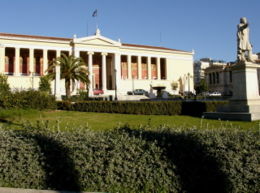 The old campus of the University of Athens, located in the middle section of Panepistimiou Street, is one of the finest buildings in the city. 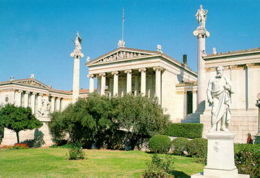 This combined with the adjacent National Library and the Athens Academy form the imposing "Athens Trilogy", built in the mid-19th century. However, most of the university's functions have been moved to a much larger, modern campus located in the eastern suburb of Zográfou. 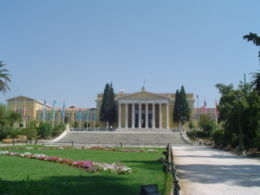 The second most significant academic institution of the city is the Athens Polytechnic School (Ethniko Metsovio Politechnio), located in Patission Street. More than 20 students were killed inside the School in November 17, 1973 during the Athens Polytechnic Uprising against the military junta that ruled the nation from April 21, 1967 until July 23, 1974. 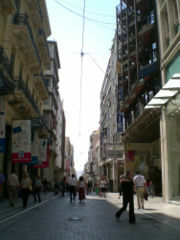 The mid-section of the popular pedestrianized Ermou ( Greek: Ερμου) Street in central Athens. Athens is home to 148 theatrical stages, more than any other European city (including the famous ancient Herodes Atticus Theatre, home to the Athens Festival , which takes place from May to October each year). 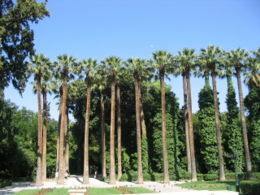 In addition to a large number of multiplexes, Athens features many romantic, open air garden cinemas. Athens also has a vast number of music venues including a state of the art music hall known as the "Megaron Moussikis" that attracts world-famous artists all year round. The Psirri neighbourhood - aka Athens's "meat packing district" - features mainstream and trendy bars making it a hotspot for the city, and a number of live music restaurants called "rebetadika", after rebetiko, a unique kind of music that blossomed in Syros and Athens from the 1920's till the 1960's. Rebetiko is admired by many, therefore virtually every night rebetadika get crammed by people of all ages that will sing, dance and drink wine until dawn. Plaka remains the traditional top tourist destination, with many tavernas featuring traditional music, but the food, though exceptionally good, is often more expensive compared to other parts of the city. Plaka, lying just beneath the Acropolis, is famous for its numerous neoclassic buildings, making it one of the most scenic districts of Athens. Nearby Monastiraki, on the other hand, is famous for its string of small tourist shops as well as its crowded flea market and the tavernas that specialize in souvlaki. 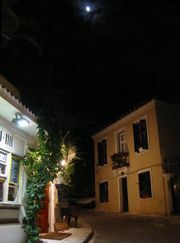 Another district notably famous for its student-crammed, stylish cafés is Theseum, lying just west of Monastiraki. Theseum, or Thission is home to the remarkable ancient temple of Hephaestus, standing on top of a small hill. The Gazi area, one of the latest in full redevelopment, is located around a historic gas factory, that has been converted into the Technopolis (Athens's new cultural multiplex) for all the family and has a number of expensive small clubs, bars and restaurants, as well as Athens's nascent " gay village". The relatively recent and rapid redevelopment of these areas has brought the - recently relatively forgotten - city centre back into the limelight. The chic Kolonaki area, near Syntagma Square, is full of boutiques catering to well-heeled customers by day and bars and luxurious restaurants by night. 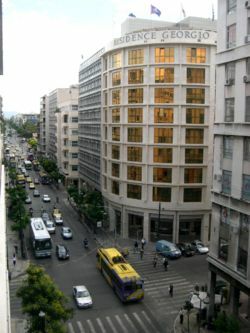 Ermou Street, an approximately 1 km pedestrian road connecting Syntagma Square to Monastiraki, has traditionally been considered a consumer paradise for both the Athenians and tourists. Full of fashion shops and shopping centres featuring most international brands, it has become one of the most expensive roads in Europe. 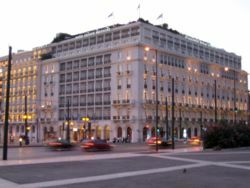 Near there, the renovated Army Fund building in Panepistimiou Street includes the "Attica" department store and several high-class designer stores. The Athens Metropolitan Area consists of 54 densely populated municipalities, sprawling around the city of Athens to virtually all directions. According to their geographic location in relation to the city of Athens, the suburbs are divided into four zones namely the northern suburbs (including Ekali, Nea Erythrea, Agios Stefanos, Drosia, Kryoneri, Attica, Kifissia, Maroussi, Pefki, Vrilissia, Melissia, Pendeli, Halandri and Filothei), the southern suburbs (including Palaio Faliro, Elliniko, Glyfada, Alimos, Voula and the southernmost suburb of Vouliagmeni), the eastern suburbs (including Zographou, Vyrona, Kaisariani, Cholargos, Papagou and Aghia Paraskevi) and the western suburbs (including Peristeri, Ilion, Egaleo, Petroupoli and Nikaia). The northern and most of the southern suburbs are particularly affluent districts, resided primarily by middle-to-high and high incomers. The western suburbs are primarily resided by middle incomers with certain few areas resided by middle-to-low incomers and still others resided by middle-to-high incomers. Finally the eastern suburbs are primarily resided by middle and middle-to-high incomers. Highway intersection in the northern suburb of Maroussi. On the left: The OTE headquarters. The Athens coastline, extending from the major commercial port of Piraeus to the southernmost suburb of Vouliagmeni for more than 25 km, is also connected to the city centre with a tram (which, although modern can be slow during rush hours) and it boasts a series of high class restaurants, cafes, exciting music venues and modern sports facilities. In addition, Athens is packed with trendy and fashionable bars and nightclubs that are literally crowded by the city's youth on a daily basis. Especially during the summer time, the southern elegant suburbs of Glyfada, Voula and Vouliagmeni become home to countless such meeting points, situated all along Poseidonos and Alkyonidon Avenues. In the winter time, the focus of the nightlife moves up into the city centre, in Piraeus as well as across the northern suburbs. 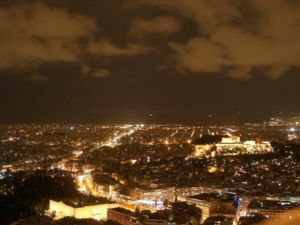 In addition, "Bournazi" at the western suburb of Peristeri has also become eminent for its intense nightlife, becoming a hotspot, mainly for the residents of the western Athenian suburbs. In the northern districts, the classy suburb of Kifissia hosts a vast number of expensive restaurants, bars and cafés. The Mall Athens is a massive, American-style mall, located in the affluent northern suburb of Maroussi, that provides a vast number of selections. 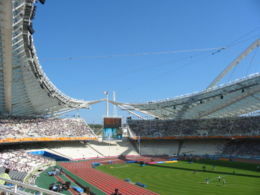 The Athens Olympic Stadium; capacity: 76,000. The Athens Olympic Velodrome, designed by Santiago Calatrava. 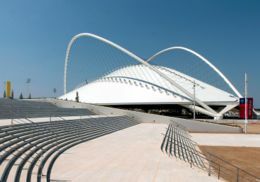 Nearby is the entirely new attraction of the massively upgraded main Olympic Complex (known by its Greek acronym OAKA). The whole area has been redeveloped under designs by the Spanish architect Santiago Calatrava with steel arches, landscaped gardens, fountains, futuristic passages and a landmark new blue glass roof which was added to the main Stadium. A second Olympic complex, next to the sea at the beach of Kallithea (Faliron), also boasts futuristic stadiums, shops and an elevated esplanade. Work is underway to transform the grounds of the old Athens Airport - named Hellinikon - in the southern suburbs into a massive landscaped park (considered to be the largest in Europe when ready). The major waste management efforts undertaken in the last decade (especially the plant built on the small island of Psytalia) have made pollution of the Saronic Gulf a thing of the past and now the coastal waters of Athens are a haven for swimmers. Athens has some of the cleanest and most pristine beaches in Europe. In fact many of Athens' elegant southern suburbs (such as Alimos, Palaio Faliro, Elliniko, Voula, Vouliagmeni and Vari) host a number of beautiful, sandy beaches, most of which are operated by the Greek National Tourism Organization . This means that one has to pay a fee in order to get in. Nonetheless, this fee is not expensive in most cases and it includes a number of related, convenient services like parking facilities, cocktail drinks and umbrellas. These beaches are extremely popular in the summer by both Athenians and foreign tourists. The city is surrounded by four easily accessible mountains (Parnitha and Penteli to the north, Hemmettus to the southeast and Egaleo to the west). Mount Parnitha, in particular, is the tallest of all (1,453 m) and it has been declared a protected National Park. It has tens of well-marked paths, gorges, springs, torrents and caves and you may even meet deer or bears while exploring its dense forests. Hiking and mountain biking in all four mountains have been and still remain popular outdoor activities for many Athenians. Casinos operate on both Mount Parnitha, some 30 km from downtown Athens (accessible by car or cable car) and the nearby town of Loutraki (accessible by car via the Athens - Corinth National Highway or the suburban railway). Lower section of busy Patission Avenue in central Athens. The Athens Mass Transit System is currently one of the most modern and efficient systems in Europe. It consists of a large bus fleet, a trolley fleet that mainly serves the downtown area, , the Athens Metro ,a tram line connecting the southern suburbs to the city centre and the Athens Suburban Railway services. It has to be noted, however, that the public transportation system is occasionally disrupted by the striking of its public employees. The Athens Metro is one of the most impressive underground Mass Transit systems in the world. It currently operates four lines, three of which are distinguished by the colors used in the relevant maps and signs (green, blue and red). The historic Green Line, which is the oldest and for the most part runs on the ground, connects the port of Piraeus to the northern suburb of Kifissia. It will be extended the next years to Drosia. The line is 25 km long and has 24 stations. The other two lines were constructed mainly during the 1990s and the first sections opened in January 2000. They run entirely underground. The Blue Line runs from the central Monastiraki district to Doukissis Plakentias avenue, in the eastern suburb of Halandri. The Blue Line then ascends on ground level and reaches Eleftherios Venizelos International Airport, using the Suburban Railway rails. The Red Line runs from Aghios Antonios to Aghios Dimitrios. Extensions to both lines are under construction, most notably westwards to Egaleo, southwards to the Old Hellinikon Airport East Terminal (future Metropolitan Park) and eastwards towards the easternmost suburb of Aghia Paraskevi. 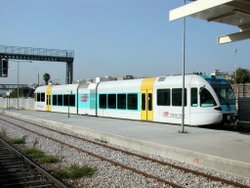 The fourth line is the Athens Suburban Railway ( Proastiakós) which connects Eleftherios Venizelos International Airport to the city of Corinth, 80 km west of Athens, via the central Larissa Train Station. The metro network, Suburban Railway not included, has a current length of 91 km and it is expected to reach 124 km (72 stations) by the year 2009. It is managed by three different companies, namely ISAP , Attiko Metro (lines 2 & 3) and Proastiakós (line 4). The bus service consists of a huge network of lines operated by normal buses, electric buses, and natural gas run buses (the largest fleet of natural gas run buses in Europe). There are plenty of bus lines serving the entire Athens Metropolitan Area. 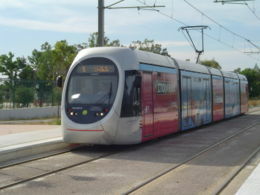 The tram runs from Syntagma Square to the southwestern suburb of Palaio Faliro, where the line splits in two branches. The first branch runs all along the Athens coastline towards the southern suburb of Glyfada while the other one heads towards the Piraeus district of Neo Faliro. Both Syntagma - Palaio Faliro - Neo Faliro and the Syntagma - Glyfada lines opened on 19 July 2004. Further extensions are planned towards the major commercial port of Piraeus and the southernmost suburb of Vouliagmeni. 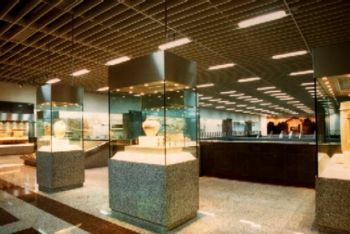 Exhibition of archaeological finds that came to light during the construction of the project displayed at the Syntagma Metro station. There are many taxis in Athens. They are quite cheap and during rush hours it is even considered normal to flag a taxi even when another customer is already in (although, formally, this is forbidden); in that case, if the one flagging the taxi happens to go to the approximate direction as the customer already using it and the customer does not mind (seldom if ever is this an issue), he is also allowed in, and each one gives the fare they would normally give as if they were the only customer. 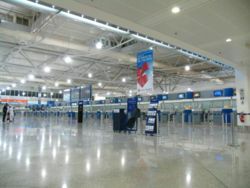 Check-in point in the Eleftherios Venizelos International Airport, "European Airport of the Year 2004". Athens is served, since March 2001, by the ultra modern Eleftherios Venizelos International Airport located near the town of Spata, in the eastern Mesoghia Plain, some 35 km east of Athens. There is an Express Bus service connecting the airport to the metro system and 2 express bus services connecting the airport to Piraeus port and the city centre respectively. Athens is also the hub of the Greek National Railway System. Ferries departing from the port of Piraeus connect the city to the Greek islands of the Aegean Sea. , westbound to Elefsina]]There are two main highways that travel both to the west, towards the city of Patra in Peloponessus ( GR-8A, E94) and to the north, towards Greece's second largest city, Thessaloniki ( GR-1, E75). In 2001-2004 a ring road toll-expressway ( Attiki Odos) was gradually completed, extending from the western industrial city of Elefsina all the way to the Athens International Airport, after encircling the city from the north. The Ymittos Ringroad is a separate section of Attiki Odos connecting the eastern suburb of Kaisariani to the northeastern town of Glyka Nera and this is where it meets the main part of the ring-road. The total length of Attiki Odos is now approximately 70 km. 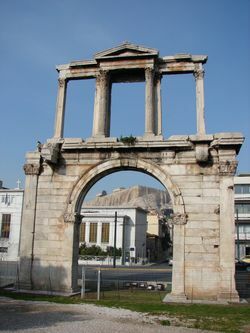 Arch of Hadrian in central Athens, with the Acropolis seen in the background. The modern city of Athens consists of what was formerly a conglomeration of distinct towns and villages that gradually expanded and merged into a single large metropolis; most of this expansion occurred during the second half of the 20th century. The Greater Athens area is now divided into 54 municipalities, the largest of which being the Municipality of Athens or Dimos Athinaion, with a population of approximately 750,000 people. The next largest municipalities are the Municipality of Piraeus, the Municipality of Peristeri and the Municipality of Kallithea. Athens can therefore refer either to the entire metropolitan area or to the Municipality of Athens. Each of these municipalities has an elected district council and a directly elected mayor. Mrs. Dora Bakoyanni of the conservative New Democracy party was the Mayor of Athens from 1 January 2003 until 15 February 2006, when she joined the Greek Cabinet as the Minister of Foreign affairs. She was the 76th Mayor of Athens and the first female ever to hold the post in the history of the city. She was replaced by Theodoros Behrakis. The next municipal elections are scheduled for October 2006. 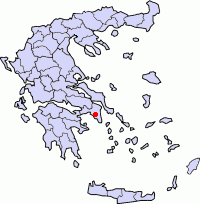 The Municipality of Athens is divided into seven municipal districts or demotika diamerismata. The 7-district division, however, is mainly used for administrative purposes. For Athenians the most popular way of dividing the city proper is through its neighbourhoods (usually referred to as areas in English), each with its own distinct history and characteristics. Those include Pagrati, Ambelokipi, Exarhia, Ano and Kato (Upper and Lower) Patissia, Ilissia, Ano and Kato Petralona, Mets, Koukaki as well as Kypseli, world's second most densely populated urban area. For someone unfamiliar with Athens, getting to know these neighbourhoods can often come particularly handy in both exploring and understanding the city. Athens is home to some of the most prestigious clubs in Europe. Panathinaikos and AEK Athens which are both multisport clubs and Olympiacos in Piraeus. It also home to innumerable other clubs some of them listed above. Beach volleyball and windsurfing are both very popular in the area. Area beaches are popular with surfers, who have created their own subculture. 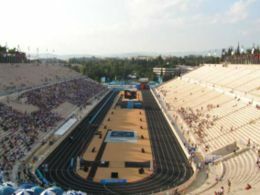 Athens has twice played host to the summer Olympic Games: in 1896 and in 2004. The 2004 Summer Olympics inspired the creation of the Athens Olympic Stadium, which has been called one of the best stadiums in the world. The city has also hosted the UEFA Champions League final twice, in 1994 and in 2007 . 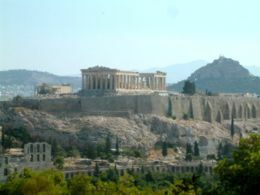 The Athens area contains all kinds of terrain, notably the hills and mountains rising around the metropolis (it's the only major city in the Europe bisected by a mountain range); four mountain ranges extend into city boundaries. Thousands of miles of trails crisscross the city and neighboring areas, providing exercise and wilderness access on foot, bike, or horse. Across the county a great variety of outdoor activities are available, such as skiing, rock climbing, gold panning, hang gliding, and windsurfing. Numerous outdoor clubs serve these sports, including the Athens Chapter of the Sierra Club, which leads over 4,000 outings annually in the area. Athens also boasts a number of sports venues, most noticeably Athens Olympic Stadium and Karaiskaki Stadium, a state-of-the-art sports and entertainment complex that also hosts concerts and awards shows such as the Arions. 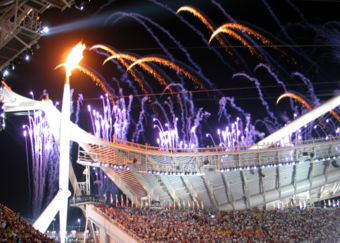 The olympic flame at the Opening Ceremony. Athens was awarded the 2004 Summer Olympics on September 5, 1997 in Lausanne, Switzerland, after having lost a previous bid to host the 1996 Summer Olympics, to Atlanta, USA. It would be the second time Athens would have the honour of hosting the Olympic Games, the first one being in 1896. After the unsuccessful bid of 1990, the 1997 bid was radically improved, and also included an appeal to Olympic history. In the last round of voting, Athens defeated Rome with 66 votes to 41. Prior to this round, the cities of Buenos Aires, Stockholm and Cape Town had already been eliminated from competition after having received fewer votes. During the first three years of preparations, the International Olympic Committee had repeatedly expressed some concerns over the status of progress in construction work of some of the new Olympic venues. In the year 2000 the Organising Committee's president was replaced by Gianna Angelopoulos-Daskalaki, who was the president of the Bidding Committee back in 1997. From that point on, preparations continued at a highly accelerated, almost frenzied pace. Although the heavy cost was criticized, as is usually the case with most Olympic cities, Athens was literally transformed into a more functional city that enjoys state-of-the-art technology both in transportation and in modern urban development. Some of the finest sporting venues in the world were created in the city, almost all of which were fully ready on schedule. The 2004 Games were adjudged a huge success, as both security and organization were exceptionally good and only a few visitors reported minor problems, mainly concerning transportation or accommodation issues. Essentially, the only notable problem was a somewhat sparse attendance of some preliminary events. Eventually, however, a total of more than 3.2 million tickets were sold, which was higher than any other Olympics with the exception of Sydney (more than 5 million tickets were sold there in 2000). Aerial view of portions of central Athens, the port of Piraeus, and some of the city's southern suburbs. The Saronic Gulf lies in the background. 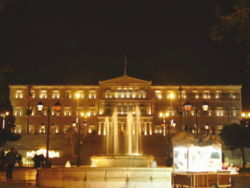 The imposing Greek Parliament on Syntagma Square is the former Royal Palace.